"This incredible dish is chock-full of fantastic flavor. Fresh veggies, garlic, soy sauce, sugar, peanut butter and a ginger flavor infused broth are tossed with noodles. Give them a try, they're absolutely delicious and sure to impress your guests!" Remove and discard the seasoning packets from the soup or reserve for another use. Fill a 6-quart saucepot with water and heat over medium-high heat to a boil. Add the noodles and broccoli and cook for 3 minutes or until the noodles and broccoli are tender. 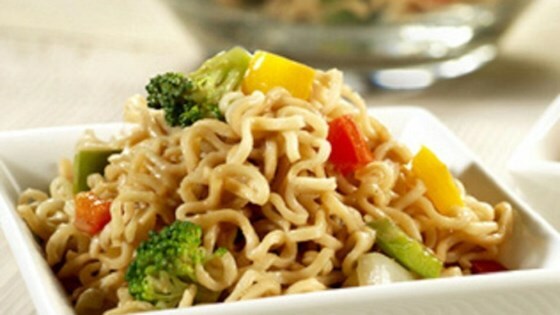 Drain the noodles and broccoli well in a colander. Beat the peanut butter, broth, soy sauce and sugar in a large bowl. Add the noodles, broccoli, pepper, onion and garlic and toss to coat. Cover and refrigerate for 2 hours, stirring occasionally. loved it. I substituted veg broth and fresh ginger for the Thai broth. very good. Good! I used fresh ginger and added bean sprouts. Despite adding the hot, drained noodles, I couldn't get the peanut butter to emulsify enough in the dressing. It had a good flavor, however.